Freshman class members await the scoring results. Waiakea'S homecoming week is always a good time. Spirited students, faculty and alumni spend the week dressing up and participating in spirit-generating activities. This year there were banner, mascot, shield and cheer competitions, class picnics, and "mass Twister" in the quad. 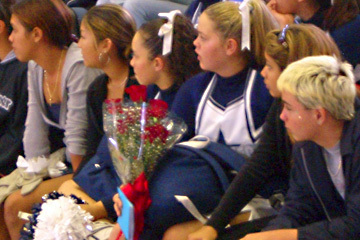 The week leads up to the big parade and the Warrior football games at Wong Stadium, but on the Friday afternoon of the game everyone turns out at the gym for the male cheerleading competition. What originated as a parody some 14 years ago has turned into a highly competitive event. Waiakea's boys have been outdoing one another in gymnastic and dance routines that bring down the house. This year's routines were filled with thumping bass, synchronized floor work and aerial throws. Each class trains a select group of boys who show signs of rhythm, athletic ability and no shame. This year the Junior Penguins took first in banner, mascot and shield categories. The senior men had an impressive show but were upset as the Freshman Sharks took the win in male cheerleading, giving them the honor of performing at halftime during the varsity football game. Members of the Freshmen Sharks male cheerleading team perform during Waiakea homecoming week festivities. The group took top honors at this year's event. 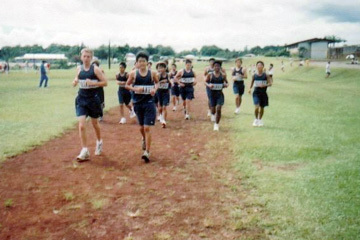 Students at Waiakea who do their sports by a track or rectangular field eagerly await the construction of an all-weather track to replace the current dirt track. In May 2004, the state government allotted $2.8 million to Waiakea High School for these endeavors, and the process began. Since then, several steps have been taken to get the ball rolling for the project, especially since funding is due to expire by June 30, 2006. If the money is not used by then, it will go back into the general fund for all of Hawaii's public schools. While all time frames for the project are tentative based upon the government appropriation and other outside factors, March 2007 is the anticipated date of completion. The first working blueprints were available in September, yet plans still have to be approved. It will then go out for contracting bids in March 2006. The plans are expected to be awarded to a contractor two months later, and a construction date of around May or June 2006 could be set. Waiakea's current dirt track will be replaced by a new all-weather track, with construction expected to begin in 2006. All physical education activities, football practices, soccer games and track and field events are expected to be held there. The cross country course will have to be reconfigured so that it does not use these areas to prevent excess wear and tear on them. A 10-foot fence will be installed around the track for security reasons; however, the community will be able to use the facilities at designated times with certain regulations. For example, during the track season, casual runners may be separated from track runners (whose spiked shoes may present a danger) by a metal partition on the edge of lane two. It is to be noted, however, that funding is only for the track. The facility will still need bleachers, a scoreboard, a press box and lighting, which could cost up $5.8 million to $6 million more. Athletics director Ken Yamase stressed that it is "key to get the (track and) field first" and to have a foundation for a permanent facility. Plans are also in the works for a community-funded weight room. While the actual project is a long way off, Yamase hopes the weight room will give Waiakea's student athletes, faculty and staff a "tremendous facility" for conditioning, cross training and physical rehabilitation. A kickoff rally and community donations will hopefully encourage the construction of a complex that will continue a legacy of permanent, accessible athletic facilities for Waiakea High School. There are many reasons why people bully others. They may do it to feel powerful or tough, to release jealousy or to extort attention or things. Consequently, bullying can hinder progress and growth in and out of the classroom and foster a negative learning environment. Although bullying is not new, it's an increasingly common problem. The American Justice Department reported that one in four students will be a victim of bullying this month. The report also states that bullying occurs every 7 minutes and that the average episode lasts 37 seconds, so teachers may not always catch the event. The Anti-Bullying Program is being implemented at Waiakea High School to help deal with all aspects of bullying. "The Anti-Bullying Program consists of courses that students, the administration and even bullies take," Waiakea Vice Principal Jasmine Urasaki said. The administration, teachers and selected students will go through training that will teach them how to deal with everyday harassment and effectively handle conflict and bullying. The training includes hands-on activities, instruction and observation on understanding and using the Anti-Bullying Program. Learning aids, stories, quotes and role-playing also will be used to increase the significance and impact of the program. Anti-bullying posters have been put up in classrooms around the Waiakea campus to increase awareness and help create a more positive environment for learning. "Do you see bullying here at Waiakea High?" "Yeah. In one of my classes, people make fun of this boy and throw things at him." "Oh yeah. People are passing in the hall, they say, 'Move,' or, 'Get outta my way,' like they're gonna give you cracks." "Of course not. I am always with mi amor." "I haven't personally experienced bullying, but I sometimes see it at school. ... It's been absorbed into our culture as acceptable behavior."